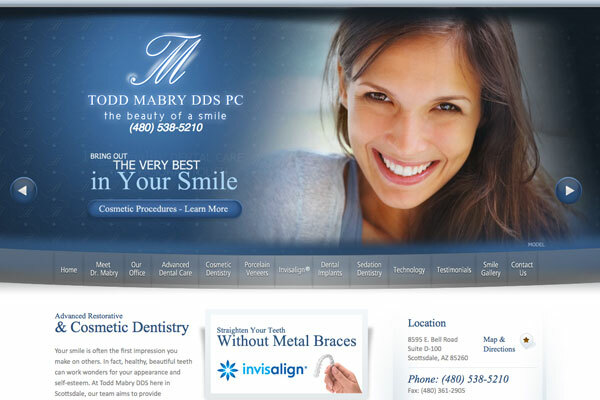 Dr. Todd Mabry, a cosmetic dentist in Scottsdale, has a philosophy of providing outstanding dental treatment along with the highest quality patient care. He and his team treat every patient as if they were family, and with that in mind, Dr. Mabry set out to construct a new website that would better represent his philosophy of care. After teaming up with San Diego-based dental website design firm Rosemont Media, Dr. Mabry was able to achieve his goal of strengthening doctor-patient communication through his new website. At his Scottsdale cosmetic dentistry practice, Dr. Mabry offers a variety of general, cosmetic and restorative dentistry procedures, including porcelain veneers, Invisalign®, dental implants, oral cancer screenings, teeth whitening and sedation dentistry. The new site provides a comprehensive overview of each procedure, along with a smile gallery, patient testimonials, access to patient forms and more. Dr. Mabry says partnering with Rosemont Media’s skilled team of SEO writers, graphic designers and web developers to create a state-of-the-art website has allowed him to showcase his commitment to online patient care. Using the most advanced marketing and SEO strategies, Rosemont Media was able to fully optimize the website’s content to achieve the highest rankings across the web.